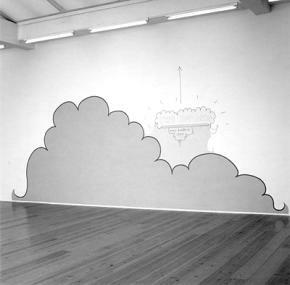 Lily van der Stokker received international recognition in the beginning of the 1990s with her large-scale wall paintings. These were striking for their 'girlie' imagery, effusive, fluorescent colours and amusing, sometimes nonsensical texts (Hoi, Kissy-Kissy, Wonderful). In interviews she has said that her research areas are love and pleasant imagery and that 'good girls' are a source of inspiration for her. Some interpret Van der Stokker's boundless optimism and (apparent) naivety as provocation. Does she want to mock the rigorous abstraction of Sol Lewitt or the rigid conceptualism of Joseph Kosuth and Lawrence Weiner? She is not interested in ambiguous or cynical comments. She would rather make work that instantly appeals 'to the heart, not the head'. The title of one of her wall paintings for Bureau Amsterdam is Art is Easy -to understand'. This can be read as a wish to communicate directly with the public. 'Art is Easy - to understand' relates to my desire to make things that can be understood by everyone.' This anti-intellectual approach to art is also characteristic of the work of some of the artists Van der Stokker has selected. In Daan van Golden and Wim T. Schippers she sees a typically Dutch fascination for the normal and the everyday. 'I draw much of my inspiration from the boring, everyday world', Van der Stokker said a couple of years ago. This could also have been said by Wim T. Schippers who installed his first solo show in Museum Fodor, Amsterdam (1962-63) as 'rooms of the truly uninteresting'. 'The texts in my work often present unnecessary, factual information; information that is important to no one, like the wall painting This building was built in 1994', (originally designed and executed on the outside wall of the Art & Public Gallery in Geneva in 1995). As with rumours, you wonder whether or not these texts are true. 'I am 42' is the text in a wall painting she made last year in London. The text for Bureau Amsterdam reads 'Lily + Jack have been living together for 10 years'. Even when enlarged to 2m x 3m, the wall paintings still retain the appearance of spontaneous sketches, intimate notations that seem intended for no one's eyes but those of the artist. In a highly individual way, Daan van Golden makes his private life, his family and familiar things around him part of his work: scrapbook-photos of Brigitte Bardot, snapshots of his daughter Diana, collages made from flowered paper. Van Golden's Compositie met Blauwe Ruit (Composition with Blue Check) is a checked handkerchief or tablecloth, as well as being a geometric, abstract composition. 2. Lily van der Stokker in an interview with Cathérine van Houts, Het Parool, 1994.